YFFUSHI is the Brand name belongs to Big Brothers . We are focused on selling Men's Clothing and the related accessories. We guarantee the style is the same as shown in the pictures. Please notice these features when you shopping on our store. Fabric: 70% Polyester and 30% Cotton. We will ship out your orders within 3-5 business day by China Post or other commercial post service. We have Standard Shipping service and Expedited shipping to choose. 1.--High Quality--This suit is made from cotton blend fabric (70% Polyester and 30% Cotton). It's soft, light, thin, skin-friendly, comfortable, not easily wrinkle-free and durable. 2.--Feature Detail--This stylish suit is one button, single breasted, notch lapel, back center vent, patch style pockets and floral printed. It embodies the confidence and fashion of men's. The jacket is fully lined and four sleeve buttons decorated at cuffs. The bottom flat front pants with slanted side pockets and vests are also with exquisite manufacture and wearing-comfort. 3.--Slim Fit--This suit with full shoulder design and slim cut with 3D draping. Slim fit suits little tighter than a regular fit suit. When you put on it make you slimmer and sharp. And looks modern and handsome. 4.--Multi Occasions--It's suitable for casual, wedding, business, performance, any fashion forward parties, nightclub, friends gathering, cosplay, Halloween, other holiday custome and ect. It makes you outstanding in the crowd. 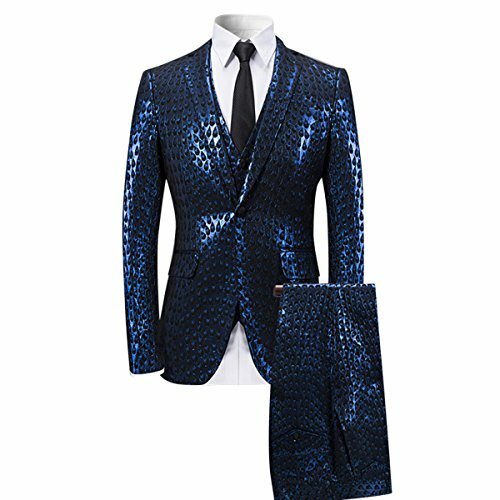 5.--What You Get--The package comes with: Suit Jackt + Vest + Trousers (Accessories are not included). About the washing care, Dry-clean only; Storage: Always hang on; Pressing: Steam ironing. If you have any questions about this product by YFFUSHI, contact us by completing and submitting the form below. If you are looking for a specif part number, please include it with your message.